PASSENGER services ran on May Day on part of the large industrial rail network in the Czech city of Ostrava as part of a public holiday tradition to have open day events at industrial locations in the city. 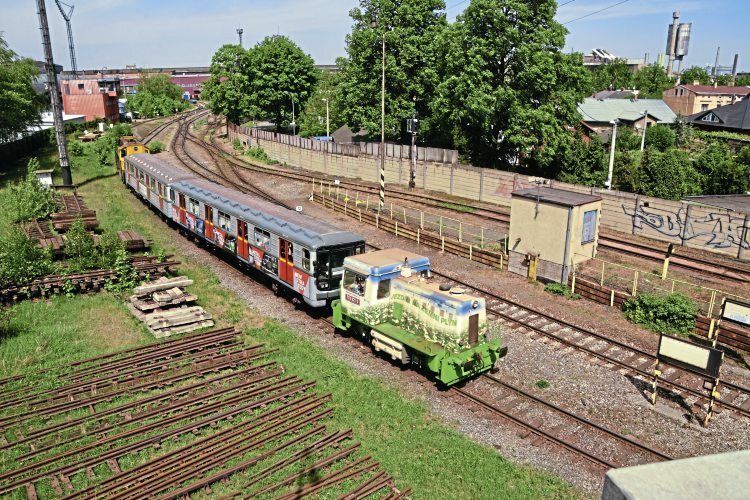 There were free hourly shuttle trains for visitors, operating between the Vítkovice Doprava loco depot (close to the Škoda Vagonka works) for about four kilometres to Vítkovice Cylinders. The trains are nicknamed the ‘Vítkovice metro’ as they utilise ex-Prague metro cars Nos. 2395 and 2501, top-and-tailed by VD locos. No. 703 821 is often used, which has been converted to operate on natural gas. Ostrava was once a major centre of heavy industry, and despite relative decline, a complex network of operational standard and narrow gauge freight lines remains. Private freight operator Vítkovice Doprava (VD) maintains a locomotive depot servicing the locos, providing transport around the area of the Vítkovice steelworks. As the country’s second largest city, Ostrava is trying to leave an industrial past of coal and steel production behind and rebrand, with some derelict factories being converted for modern use, such as an arts centre. Our thanks to Shaun Wallace for information in this report. Read more News and Features in the June issue of The RM – on sale now!